On the 9th (Sun), examine the collection at Ten Ren Tea Culture Museum, don't miss a visit to Gong Wei Xu Tunnel, then walk around Maolishan Park, and finally see the interesting displays at Huoyanshan Forest Ecological Museum. To see other places to visit, more things to do, and more tourist information, go to the Miaoli City itinerary planning website . Singapore, Singapore to Miaoli City is an approximately 11-hour flight. You can also drive. 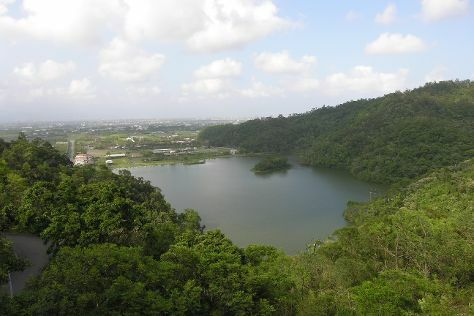 In June, daytime highs in Miaoli City are 36°C, while nighttime lows are 28°C. Finish your sightseeing early on the 9th (Sun) to allow enough time to travel to Hsinchu. On a trip to Hsinchu, an industrial hub in Northern Taiwan, you can combine pleasant walks in the parks and along the harbor with wider explorations in the area. Start off your visit on the 10th (Mon): take in the waterfront activity at 17 Kilometers Hsinchu Coast Scenic Area, enjoy the sand and surf at Xinyue Beach, and then browse the range of quality goods at Big City. 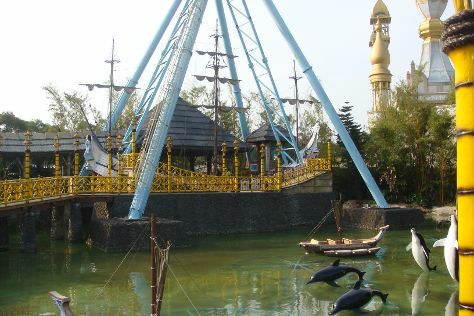 Keep things going the next day: find something for the whole family at Leofoo Village Theme Park. For reviews, more things to do, ratings, and more tourist information, read Hsinchu trip itinerary planner . Getting from Miaoli City to Hsinchu by car takes about an hour. Expect a daytime high around 37°C in June, and nighttime lows around 30°C. Wrap up your sightseeing on the 11th (Tue) to allow time to drive to Taipei. Satisfy your inner culture vulture at Ximending and Hsing Tian Kong. Popular historic sites such as Chiufen (Jiufen Old Street) and Yangmingshan National Park are in your itinerary. Change things up with a short trip to Keelung Harbor in Zhongzheng District (about 1h 05 min away). There's lots more to do: buy something for everyone on your list at Taipei 101, take an in-depth tour of National Palace Museum, and appreciate the history behind Chiang Kai-Shek Memorial Hall. To find photos, reviews, and other tourist information, refer to the Taipei online route planner . Getting from Hsinchu to Taipei by car takes about an hour. Other options: take a train; or take a bus. In June, daily temperatures in Taipei can reach 38°C, while at night they dip to 30°C. Finish your sightseeing early on the 14th (Fri) so you can drive to Wujie. On the 15th (Sat), relax and rejuvenate at some of the best spas, then take in the dramatic scenery at Wufengchi Waterfall, and then stroll through Yilan Lover's Bay. To see maps, other places to visit, traveler tips, and tourist information, you can read our Wujie visit planner. Traveling by car from Taipei to Wujie takes an hour. Alternatively, you can take a train; or take a bus. In June in Wujie, expect temperatures between 38°C during the day and 30°C at night. 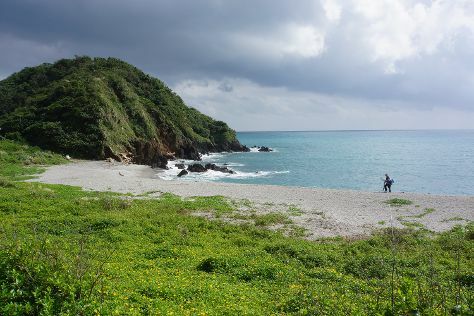 Finish your sightseeing early on the 15th (Sat) so you can travel to Dongshan. Kick off your visit on the 16th (Sun): identify plant and animal life at Dongshan River Forest Park, then take in the dramatic scenery at Xinliao Waterfall, and then explore the activities along Meihua Lake. Planning Dongshan trip won't be overwheling when you use's Insprock itinerary maker. Dongshan is just a stone's throw from Wujie. Expect a daytime high around 38°C in June, and nighttime lows around 30°C. Cap off your sightseeing on the 16th (Sun) early enough to travel to Su'ao. Start off your visit on the 17th (Mon): make a trip to Nanfangao Lookout, kick back and relax at Neipi Beach, then look for gifts at Nanning Fish Market, then make a trip to Nanfangao Nantian Temple, and finally contemplate in the serene atmosphere at Navy Beifang'ao Jinan Temple. For reviews, more things to do, and tourist information, read Su'ao itinerary app . Su'ao is just a short distance from Dongshan. Expect a daytime high around 38°C in June, and nighttime lows around 30°C. Finish your sightseeing early on the 17th (Mon) to allow enough time to travel to Alishan. Escape the urban bustle at Ali Mountain (Alishan) and Tanayiku. Explore hidden gems such as Alishan National Forest Recreation Area and Jiaming Lake. Take a break from Alishan with a short trip to Lisong Hot Spring in Haiduan, about 1h 20 min away. For photos, where to stay, ratings, and tourist information, use the Alishan road trip planning site . Traveling by car from Su'ao to Alishan takes 5.5 hours. Finish your sightseeing early on the 20th (Thu) to allow enough time to travel to West District. On the 21st (Fri), see the interesting displays at Chiayi City Historical Relic Museum, steep yourself in history at Suantou Sugar Factory, see the interesting displays at Chiayi City Koji Pottery Museum, don't miss a visit to The Hinoki Village, then admire the landmark architecture of Hinoki Village, and finally examine the collection at Museum of Ancient Taiwan Tiles. To find ratings, maps, more things to do, and tourist information, go to the West District holiday planner . You can drive from Alishan to West District in 2 hours. Wrap up your sightseeing on the 21st (Fri) to allow time to take a train to Taichung. Lukang and Wenwu Temple are good opportunities to explore the local culture. Bring the kids along to National Museum of Natural Science and National Taiwan Craft Research and Development Institute. You'll find plenty of places to visit near Taichung: Hehuan Mountain (Hehuanshan) (in Ren'ai Township), Lugang Old Street (in Lukang) and Formosan Aboriginal Culture Village (in Yuchi). There's still lots to do: explore the world behind art at National Taiwan Museum of Fine Arts and examine the collection at 921 Earthquake Museum of Taiwan. To find ratings, traveler tips, and other tourist information, read Taichung trip itinerary builder . Take a train from West District to Taichung in an hour. Alternatively, you can drive; or take a bus. Expect a daytime high around 36°C in June, and nighttime lows around 28°C. On the 25th (Tue), wrap the sightseeing up by early afternoon so you can travel back home.